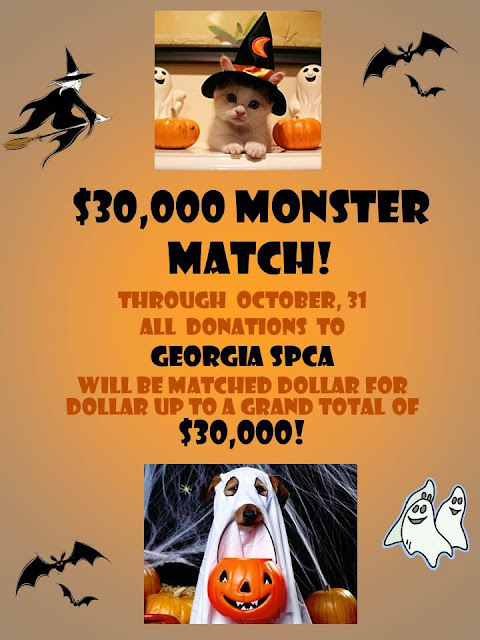 Donate to Georgia SPCA during the month of October, and your donation will be doubled, up to a grand total of $30,000! In special recognition of our monthly recurring donors, your donation will receive an extra match! Your $10 donation becomes $30, a $25 donation becomes $75, and so on. You can set up a recurring donation in any amount through Georgia SPCA secured website using a debit or credit card. You can designate your contributions for the general shelter fund, to Compassionate Hearts - our fund for animals with special medical needs - or make a tribute donation honoring a special person or pet. You can also mail a check: Georgia SPCA, 1175 Highway 23, Suite 109, Suwanee, GA 30024. Donations can be changed or stopped at any time. Thanks so much for your support! If you prefer to make a one-time donation, you can still dedicate it to someone special, place it in our Compassionate Hearts Fund, or, you can even have your own Personalized Georgia SPCA Donation Page, promoting any special event. You can also help by coming to Howl-O-Ween (you'll see me at the judge's table) celebration on October 28. All profits from the event will count toward the Monster Match!